Are You Feeling Blue This Holiday Season? We’re days away from Thanksgiving and about a month later Christmas will be here. That’s great news for a lot of people, but for some, the holidays bring on a major case of the blues. Sometimes those blues stem from the fact that people can’t be with their families, which is perfectly understandable, while other times it’s because they’re not where they want to be in their lives. But a lot of times, it’s because people think God has let them down and they’re disappointed in Him. Here’s what I’ve noticed. Many times, Christians believe that our lives should be perfect. Free from worry, hardships, or tragedies if we only have enough faith. But is that really what the Word teaches? Try telling that to Paul, as he sat in prison unjustly prosecuted and sentenced to death, that his lack of faith brought on his troubles. Or what about the apostles? Almost every one of them died a horrible death, yet they were steadfast in their belief in Jesus. Did a lack of faith really contribute to their terrible deaths? And we won’t even talk about the suffering Jesus endured. Personally, I think it’s tragic that God takes a bum rap for something He never promised us. Yes, He wants what’s best for us, and will do anything to make sure we spend eternity with Him. But He never promised this life would be easy—only the next one. So why do some push that falsehood on other believers? The two possible outcomes are that when the believers encounter troubles—and they will—they will either blame themselves for not having enough faith (even though Jesus told us faith the size of a mustard seed is sufficient), or turn against God because of a promise He never made. It just seems unfair to me—to set up false expectations like that. I think it puts believers at a disadvantage—a no win type of situation. The truth is that Jesus said we will have troubles in this world. He did, and so every true believer in the Bible. But they remained steadfast, knowing that their Lord would work it out in the end. And that’s what we’re called to do, too. So if you find yourself feeling blue this holiday season, it’s okay. We all go through struggles and hard times and uncomfortable places. That doesn’t make us any less faithful, and it certainly doesn’t make God any less God. Put your faith in Him—in His Character and the promises He’s made for eternity. I know it hurts. The pain can be unrelenting and can seem to go on forever. But it won’t. When you’re feeling depressed, remember the great ones who came before you. Elijah sat under a tree and told God he wanted to die. God told him to nourish himself, much in the same way we can do today by reading the Word. And think about David. How many times did he lament in the Psalms that all was lost? But those Psalms show us the way out of the blues. David, no matter how low he felt, always ended by praising God because he understood His character. He knew who he served. Are you feeling the blues this holiday season? If so, you’re not alone. God is there, waiting for you to pour out your heart to Him and ask Him to comfort you. Do it now. And then write me and tell me how He was able to heal your heart. The Fragrance of Surrender is in the News! Look what the press is saying about my new christian novel! April Geremia, author of “The Fragrance of Surrender” rescheduled the release of her new book to give those struggling with holiday related depression some hope. April Geremia understands what it’s like to struggle with depression and maintaining one’s faith through difficult times. She hopes her first book, “The Fragrance of Surrender,” released earlier this month, will offer hope to those dealing with depression through the upcoming holiday season. 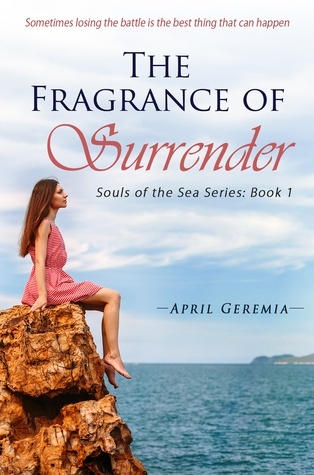 First-time author April Geremia is celebrating the early release of her debut Christian novel, “The Fragrance of Surrender,” with a fervent wish. She hopes her story reaches those in need of uplifting during the upcoming holiday season. Geremia has been writing professionally for 20 years, but “The Fragrance of Surrender” is her first full-length work of fiction. The busy writer is not resting on her success, though. She’s already hard at work on the second book in her “Souls of the Sea” series, which is scheduled for a spring release. To that end, Geremia has started an Advance Readers Club for “The Fragrance of Surrender” and all her future books. The first 30 readers who enjoy inspirational fiction for Christian women can sign up for the club at Geremia’s website, aprilgeremia.com. Members will receive free advanced copies of the just-released book, as well as advanced copies of new work as it becomes available. In addition, readers will have a chance to win a free signed copy of “The Fragrance of Surrender” through Goodreads.com starting tomorrow, November 18. “The Fragrance of Surrender,” originally set for a November 28 publication date, was released November 10 in time for the Thanksgiving rush. It’s currently available through multiple online publishers and marketplaces, includingAmazon, Barnes and Noble and iBooks. It’s available in paperback, and as a download for Kindle, iBooks, Nook, and Kobo readers. About: April Geremia has made her living as a professional writer for 20 years, and has recently turned her attention toward her true love—fiction. She loves God, her family and friends, the sea, mysteries, and stories of people battling impossible situations. The books in the series, Souls of the Sea, all have those elements in common. For more information about “The Fragrance of Surrender, please visit www.aprilgeremia.com or contact Psalm 96:3 Press at (715) 513-7107. Win a Free Copy of The Fragrance of Surrender﻿ on Goodreads! I just wanted to let you know that starting tomorrow, November 18, you can sign up on Goodreads to win a free copy of my book. It will be a signed copy of the paperback edition. Good luck! Christian Fiction Book, The Fragrance of Surrender is Now Available! Well, it finally happened. After years of working on the book, The Fragrance of Surrender is now out there. Officially out there. It's available everywhere right now, and I'm dying to hear what you think. So anxious in fact, that I'm forming an Advanced Reader's Club for this book and all my future ones where I'll provide a free manuscript of the book, and solicit feedback from a select group of readers. I want to write the kinds of Christian fiction books you want to read, and your feedback will go a long way in ensuring that. If you would like to be a part of the group (It will consist of 30 readers), just shoot me a message in the "Contact Me" page and I'll add you to the list. Remember, this is limited to the first 30 people who contact me, so don't delay! The Fragrance of Surrender Will be Released Early! I’ve been working on my book, The Fragrance of Surrender, like a mad woman trying to finish the editing and last minute things in time to make the November 28 deadline for its release. Amazingly, I not only made the deadline, but I beat it. I’m happy to announce that the book will be published before its scheduled release date. In fact, I’ve done everything I can and it’s in the hands of the formatter right now. As soon as I receive it, I’ll upload it to all the sites, and within 3 days, it will be live. This isn’t just any book. It’s a story about God, and I realize that in some small way, I’m representing Him in the telling of Gabriella’s struggle to find faith. That’s a big responsibility. My prayer is that believers will come away from the book with a renewed sense of wonder and faith, and those who don’t yet know God will open their hearts to Him. I’ve poured out my heart into this book, and it would be so wonderful if it were met with enthusiasm. But honestly, if it makes just one person deepen their relationship with God, I’ll feel that I’ve done my job. ​Have you ever stepped out in faith and done something you’ve felt called to do by God? How did it turn out? I’d love to hear about your experience! Do you trust God? I mean, really trust Him in a way that no matter what happens, you believe He’s in control and things are as they should be? I have to admit, I’ve had my moments. Don’t get me wrong, I love God. He is the reason for my being, and I believe every word in the Bible without hesitation. But there have been times when I’ve wondered if He’s dropped the ball. I haven’t had an easy few years. In fact, they’ve been horrible, but I’ve always managed to stay strong in my faith because I trust that He knows what He’s doing and everything will work out as it should. But a few weeks ago, things came to a head and I suffered a major blow. I realize what I should have done was instantly fall to my knees and go to the One who loves me with an infinite love. But that’s not what I did. I threw a hissy fit. An epic fit. Right in my backyard in front of my neighbors. For everyone to see. As I regrouped and began to think about my reaction, I was stunned. Why would I, who truly loves God, question Him and rant and rave when I didn’t get my way? And if I reacted like that, how in the world are unbelievers supposed to trust Him when things don’t go their way? And then I realized the answer. When we trust people in this life, it’s because we know them. The more we get to know someone, the stronger our trust (or distrust) grows. And it’s the same with God. When we truly know Him for who He is—His character, His intentions, and His promises—there is no way we can question Him. He’s just too wonderful. That’s faith, people. We can hear about Him all day long, but it’s not until we “see” Him that we really come to know and trust him. So, if I know God so well, why did I throw a fit when things went wrong? I don’t know the answer to that, but I do know this: It was a sign to me that I need to dig in deeper with Him and figure it out. Read more of His Word, spend more time in prayer, and ask Him to show me the error of my thinking. Because trusting Him is the safest and best thing we can do. ​What about you? Have you ever thrown a fit and questioned God when He didn’t do things your way? What was the result? Did it bring you closer to Him?